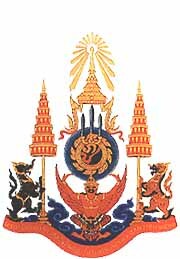 Name: The Royal Ceremonial Emblem on the 5th Cycle Birthday Anniversary of His Majesty the King, 1987. Definition: The Royal Garuda signifying the State, meaning the Government and the People, respectfully supporting the discus and the ancient sword, symbolizing the Chakri Dynasty and His Majesty King Bhumibol Adulyadej. The clockwise discus signifies the power of righteousness. The Royal Crown with golden rays, flanked by royal umbrellas and royal belongings, signifies the power of the monarch. The mythological lion symbolizes the civilian side, and the mythological half elephant-half lion figure symbolizes the military side. They hold the royal umbrellas and the royal belongings, signifying the two branches of officials that undertake state affairs in the name of His Majesty the King.